Not content with just seeing one fjord when planning our Norway visit, we decided to try to see a bit more of the country before heading to Bergen and take a side trip from Voss to Hardangerfjord. 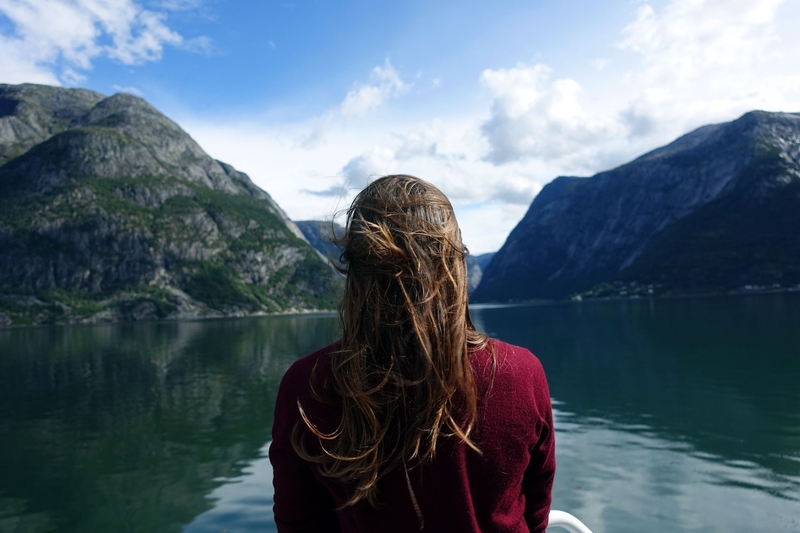 This actually turned out to be a great decision as the day before when we did our DIY Norway in a Nutshell route, we weren't able to go on the Fjord cruise due to a boat breaking down and so were grateful that we had another fjord to look forward to. Our initial plan had been to essentially do a DIY version of the 'Hardangerfjord in a Nutshell' (offered by the Norway in a Nutshell company in case you couldn't guess). 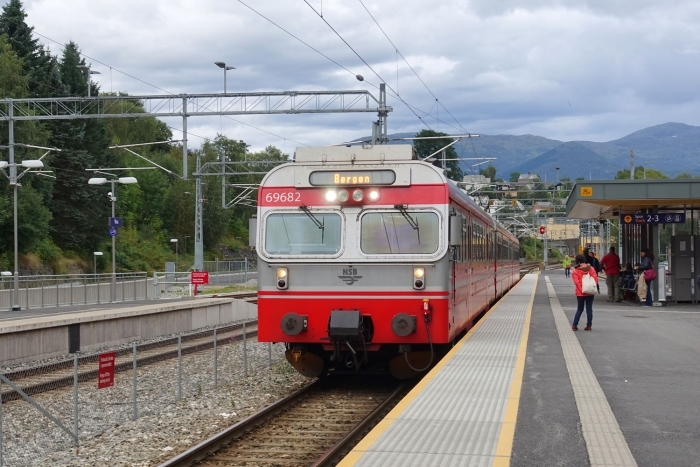 With their trip you can either start in Bergen and get the train to Voss and then do the rest of the journey as detailed below or you can start in Oslo and do the Norway in a Nutshell tour but stop at Voss, stay overnight and then continue as below. 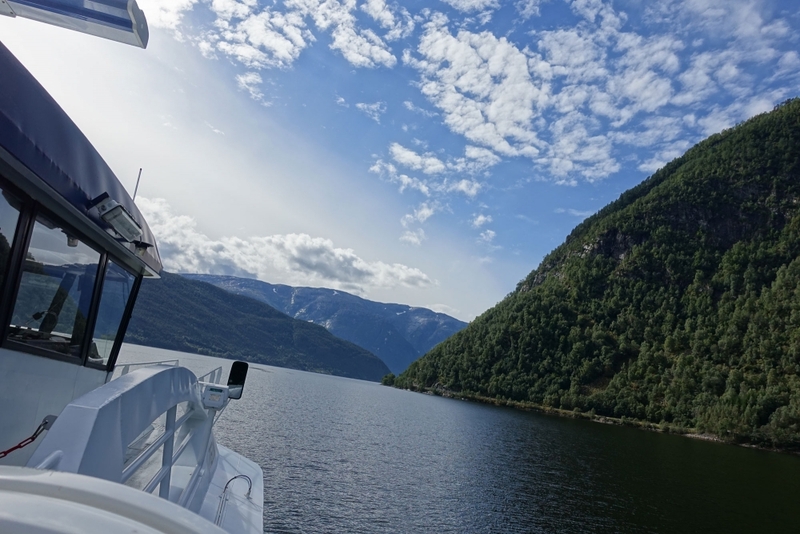 The route essentially takes you from Voss to Ulvik where you get on a boat to Eidfjord. 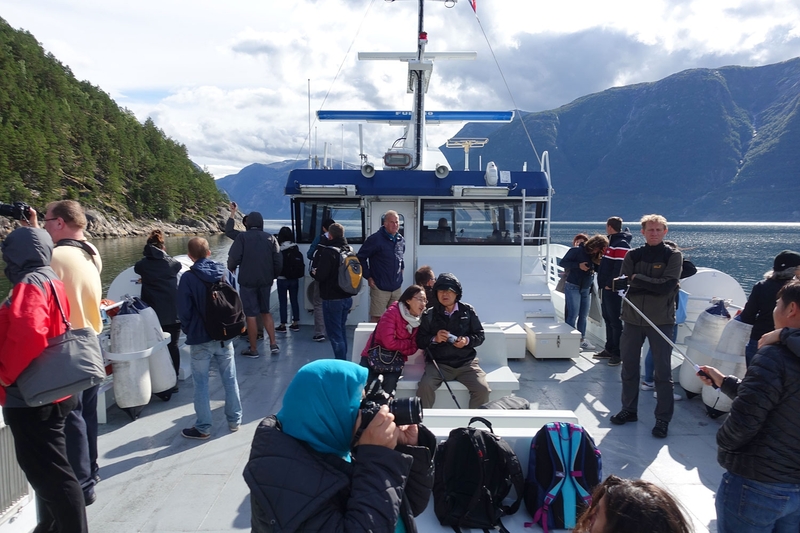 There is a several hour break at Eidfjord where you can do a number of different activities and then you get on the same boat and continue to Norheimsund. From there you catch a bus to Bergen. As explained in the 'Do it yourself: Norway in a Nutshell' article, the Norway in a Nutshell company sell you tickets on public transport (which anyone can book or use) but send them to you altogether, essentially meaning you are paying for the convenience. For the Hardangerfjord in a Nutshell tour, they also include a trip to Vøringsfossen waterfall when you arrive in Eidfjord. In the end we actually changed our plans at the very last minute whilst in the middle of the above journey but having researched the whole thing anyway, I'll explain what we ended up doing but also how you can do a DIY Hardangerfjord in a Nutshell if that's your aim. It was very easy to do the first part of the journey which was from Voss to Ulvik. This was on one of the public buses (number 945) and it left from outside Voss train station at 10.05am. As it is the public bus service you cannot book tickets in advance but you can look at the timetables and do some journey planning on their website - Skyss. We paid the bus driver for our tickets which were 102 NOK per adult (and the driver helpfully had change so we didn't need the exact fare). The journey is about an hour long and the driver very helpfully paused at some pretty scenes along the way, even stopping at one of the waterfalls we passed to allow us to get out and take pictures. 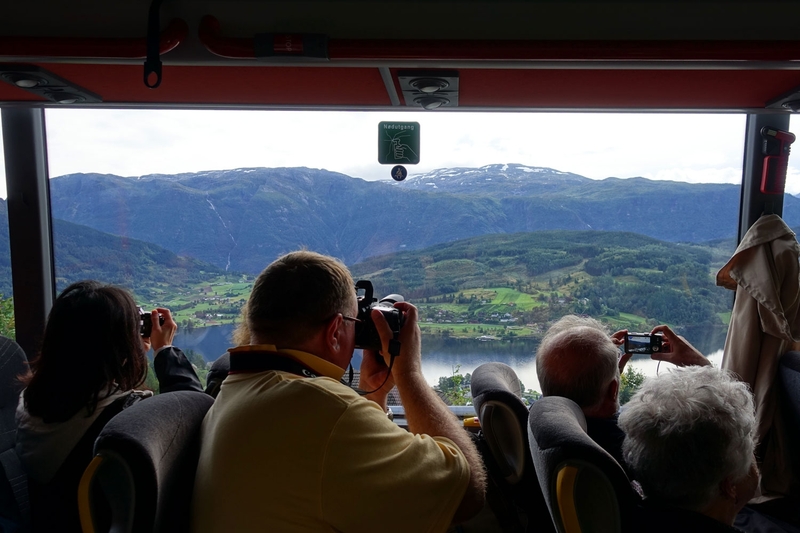 As with the Norway in a Nutshell route - this bus was full of tourists taking the Hardangerfjord in a Nutshell trip and so you essentially just need to follow the masses when transferring between stops. On arrival at Eidfjord, the bus stopped right beside the port. The bus arrives in at 11.10am and the boat leaves at 11.15am. Again, as with the Norway in a Nutshell tour, everything waits for the previous stop so you don't need to worry about being delayed or late - the boat will wait for the bus. We booked our ticket from Ulvik to Eidfjord in advance on the Norled website. Just to be aware - this isn't a cruise boat, it is an express tourist boat and so there is no commentary or information about the area. It is also important to know which boat it is when you are booking. We paid 130 NOK per adult and were emailed an e-ticket to print out and bring with us. On arrival at the boat we were asked if we had sight-seeing included. This is because if you book with the Norway in a Nutshell company, their ticket includes a trip to Vøringsfossen waterfall. We said no and were told that if we decided we wanted to go to the waterfall we could speak to someone on board and be put on a waiting list to go if there was room on the other side. The waterfall is not walk-able from the town and so you need private transport or a tour to get up to it. 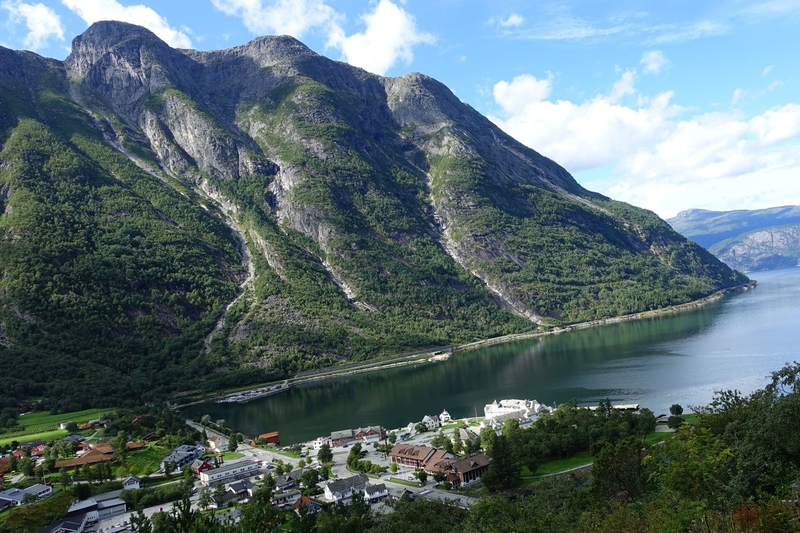 We hadn't really thought about what we would do in Eidfjord - we weren't wowed by pictures of the waterfall so had just figured we would go for a walk or ask at tourist information for ideas to do in the few hours break we had there. 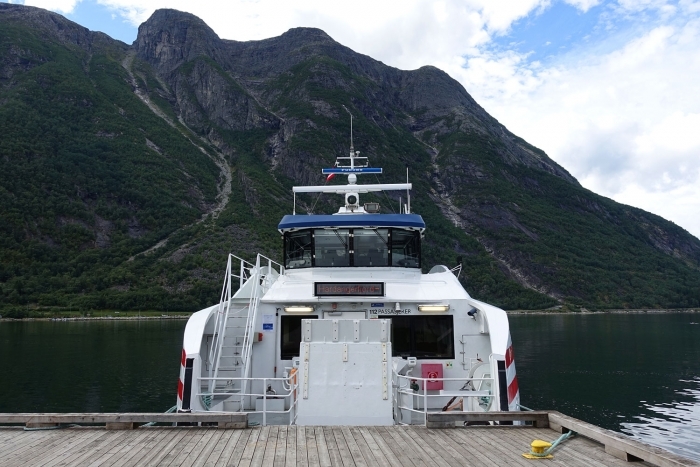 This first boat journey lasts 30 minutes and goes up Ulvikfjord and then down to Eidfjord. Thankfully we had a much nicer day weather-wise than the day before and so it was really enjoyable trip. We stayed on the upper deck and managed to get some stunning pictures of the fjord. The tourist information office is right beside where the boat disembarks and even though it was a Sunday it was helpfully open. Most people from the boat went onto a coach that was waiting for them and few followed us into tourist information with the lady from the boat, negotiating travel up to the waterfall (which seemed to be around 700 NOK for a private car which could hold up to 4 people). After a little look around, we were drawn to sea-kayaking on the fjord with Flat Earth Adventures. I have never been kayaking before, and we both figured that kayaking on the fjord was going to be a lot more fun that the cruise that we missed out on the day before. The problem was how to make it fit in with our schedule. The next kayaking trip was leaving at 2pm and we were supposed to be getting on the boat again at 2.40pm. This was an issue as the kayaking trip was 3 hours long. There were no other boats to be able to get to Norheimsund after this and so we came to the conclusion that we would have to go back to Voss and get to Bergen from there (thankfully we hadn't booked the second boat as described below and were planning on buying it on the day). After working out that we could definitely make it to Bergen that day, we asked tourist information if they could check if there were any spaces. She kindly phoned for us and booked us on the 2pm trip. We paid there and then (510 NOK per adult) and were told to meet the guide by the supermarket at 2pm. 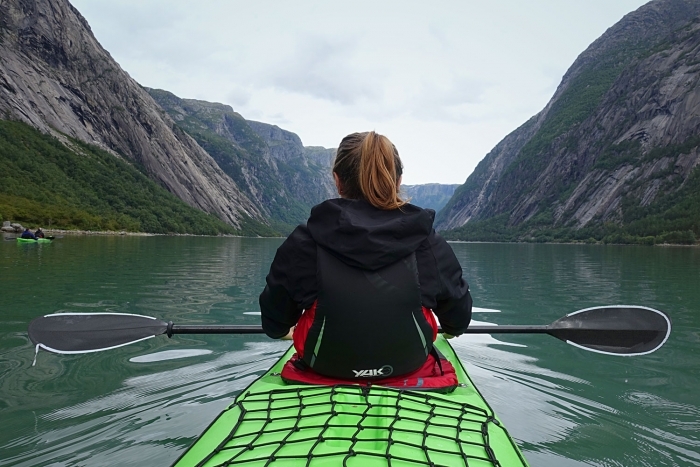 We have written a dedicated article about the sea-kayaking but I will say it was absolutely amazing and I am so glad that we took the risk and booked it as it was one of the best things we did in Norway! Whilst waiting for the kayaking we did a short walk up to a viewpoint - tourist information gave us a little map with some crude directions on how to get there. It was a little steep but it was a great interim activity and gave us some lovely views out over the fjord. We had lunch up there before heading back down to do the sea-kayaking. After coming back from the waterfall trip, the next step would be to head to Norheimsund on the same express boat. This is a 2hrs 50mins trip through the fjords and departs as mentioned above at 2.40pm. It arrives into Norheimsund at 5.30pm. As with the boat from Ulvik to Eidfjord, you can book in advance online on the Norled website and it is 311 NOK per adult. It is worth saying that this expressboat on Hardangerfjord is a summer service only and so before going - do check that it is running using the Norled website. The final stop on this route is from Norheimsund to Bergen. This is by bus (number 925), and again the stop is just beside the port. It is run by the same public bus service as the earlier bus and so you can check timetables on the Skyss website. Again, as it is a public bus, tickets need to be bought on board and cannot be purchased in advance. The bus leaves at 5.45pm and gets into Bergen at 19.10. Unfortunately as we did not end up travelling this route I cannot tell you the definite price per adult but using the Skyss zone map I think it may be around 160 NOK each. After our sea-kayaking adventure it was time to try to get from Eidfjord back to Voss. This involved initially getting a bus. The bus stop in Eidfjord is beside the Joker supermarket and opposite the petrol station. There is a little wooden shelter which has timetables inside. We used the Skyss website again to work out where we were going. 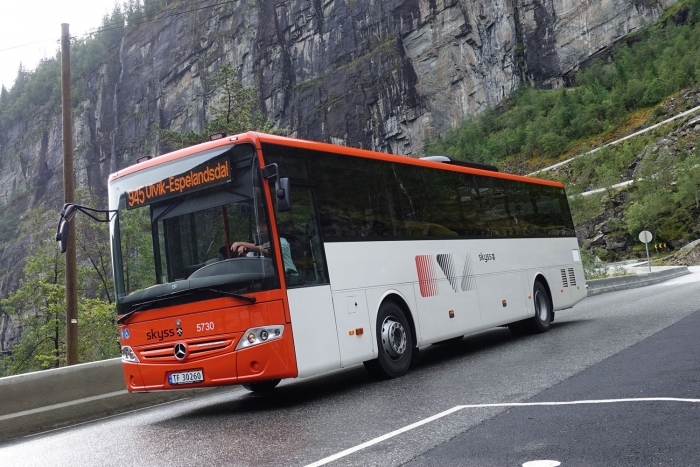 All buses from Eidfjord need to change at a stop about 15 minutes outside of the village called Ullensvang. So we got on the bus (number 991) at Eidfjord and paid this driver for a ticket all the way to Voss which was 100 NOK per adult. This bus then terminated at Ullensvang and we all got out and waited for the next bus to turn up to take us to Voss (number 990). The whole journey took about an hour; we left Eidfjord at 6pm and arrived in Voss (just outside the train station again) at 7pm. We then took the train from Voss to Bergen (which is actually the same train as the final stop on the Norway in a Nutshell tour). This was using the state railway service and we bought our tickets on arrival at the station which were 199 NOK per adult. The train left at 7.40pm and we got into Bergen just at 9pm. So there you have it - how to do the Hardangerfjord in a Nutshell tour by yourself and how to change your plans if needs be and do some sea-kayaking in Eidfjord instead!